X-rays are an important diagnostic tool and the only way we have of seeing what’s happening within your teeth and the health of the soft tissues around them and bone that supports them. This is why we need to take a full-mouth series when you first come to us as a patient – and why we will take individual images when we see concerning situations during a visual exam or if you complain of tooth pain. Digital x-rays offer a number of benefits over conventional film. For one, they drastically limit radiation exposure – as much as 90% less than with conventional film x-rays. Digital also means we have no need to keep highly toxic developing chemicals in the office. The images show up instantly on a screen – no developing needed. This also makes it easier to compare images across time and to enlarge, brighten or otherwise adjust them to give us the best and most useful view to make a proper diagnosis and recommend solutions. The earlier we can see decay, the easier and less invasively we can treat it. CariVu is a new technology that gives us even better “eyes” for spotting caries in its earliest stages. This non-invasive tool casts near-infrared light on the teeth, which makes tooth enamel appear transparent, while decayed areas absorb the light. 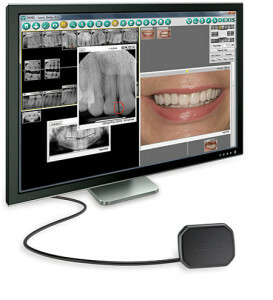 Like an x-ray, CariVu lets us see through the tooth, exposing its actual structure, as well as that of any lesions. CariVu is quick, accurate and painless. This allows the clinician to see through the tooth exposing its structure and the actual structure of any carious lesions with very high accuracy. Everyone was very friendly, kind and professional. I was made to feel relaxed and comfortable. Even the waiting room was very nice and relaxing. I am hoping my insurance will pay for my needs so I can go back.